West Ham manager Sam Allardyce hopes his players can "kick on" from their Capital One Cup quarter-final victory against Tottenham as the Hammers look to improve their Premier League form. The Irons, who are 17th in the league, beat managerless Spurs 2-1 at White Hart Lane on Wednesday to reach the last four of the League Cup. 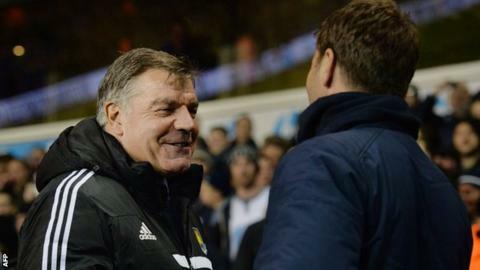 It was their first win in four games and Allardyce said: "It's a relief. "For me, the challenge is to get the players to kick on from this." Spurs, with caretaker manager Tim Sherwood in charge following Andre Villas-Boas's sacking on Monday, took the lead in the second half when Emmanuel Adebayor volleyed home superbly for his first goal since May. But the Hammers levelled late on through Matt Jarvis before substitute Modibo Maiga headed in the winner five minutes from time. They will play Manchester City in the semi-final, with the first leg taking place in the week commencing 6 January. "We saw the shaken nerve-ends of Tottenham when we scored," said Allardyce. "We then went for the jugular. Our substitutes, who came on with fresh legs, exploited the spaces." It was West Ham's second win at Spurs in three months, following October's 3-0 victory in the league. Allardyce's men have only won two other Premier League games so far this season, though, and are just one point above the relegation zone. "When we beat [Tottenham] last time, I thought we'd go on a run of results and pick up more points than we have done," he told West Ham's official website. "I don't know where we'll go from here but it's just a fantastic result and the lads are absolutely delighted."